Put a floating rubber duck in your teacup with Duck Floating Tea Infuser. Fill the stainless steel mesh infuser with loose tea. Place the duck tea infuser in your tea cup and let him float around in the hot water until the desired brew strength has been achieved. Lift the rubber duck out of your tea cup and put him into his drip cup. Overall size of tea infuser is 2-Inch diameter when resting in the drip cup. Hand washing is recommended.Packaed in 132 pcs/ctn. 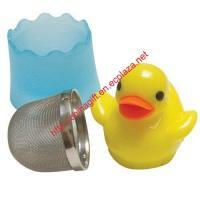 Our company is specialized exporter, manufacturer and supplier of Duck Tea Infuser in China.